BestofTexas.com, a network of interactive lifestyle and community websites, is starting the year off with a chance to win a trip for two to the Cayman Islands. To be entered, simply sign-up as a member of the website, which is free and allows users to write reviews, print coupons, receive discounts, newsletters and more. The growing company is also looking for new faces to add to the Sales team. The new year has arrived and BestofTexas.com is starting it off with a bang. The company has big plans for 2009 including launches in over one hundred cities and neighborhoods throughout the state of Texas, increased community interaction and participation and more perks for members. 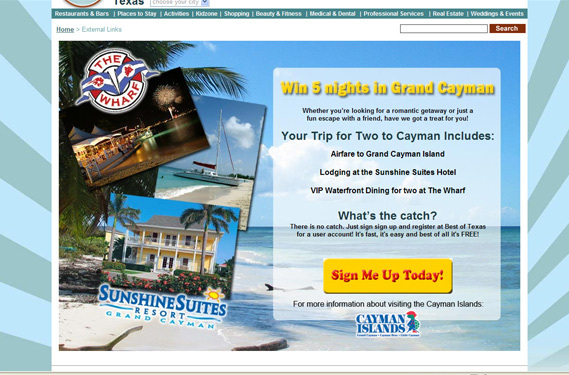 BestofTexas.com is offering new and existing members a chance to win a free trip for two to the Cayman Islands. The five-night, six-day trip includes free airfare provided by the Cayman Islands DOT, lodging at the beautiful Sunshine Suites on Seven-Mile Beach, a VIP dinner at The Wharf and much more. It does not cost to sign-up for the drawing, as membership on BestofTexas.com is free. This year's winner will be chosen before July and will be notified by phone live on the radio. This will be the second trip to the Cayman Islands given away by the community-based website. Last year's winner, Monica L., returned from her trip this past December and had nothing but wonderful things to say about her free vacation. "We had a blast and are so thankful for the opportunity to have been there. The water was BEAUTIFUL and the people were so friendly. We also went snorkeling in Stingray City and to our dinner at the Wharf, which was delicious. Sunshine Suites was very nice and we really enjoyed Sunshine Grill. I still cannot believe I won this trip!!! That was the 1st vacation we have had together in 5 years and we had time of our lives. Thanks y'all so much!" Best of Texas (BOTX) members are constantly rewarded for their membership and participation on the site with discounts and coupons, tickets to sporting events, drawings for gift certificates and free vacations. In 2008, the company gave away a VIP Dallas Mavericks package, VIP Dallas Stars Package, FC Dallas tickets, free massages, and gift ceritificates to dinner. All of these will be given away throughout 2009, as well as many other exciting offers the company plans to reveal during the year. Not only is the company growing throughout Texas, they're growing internally as well. BOTX is currently hiring Inside and Outside Account Executives. In the second half of 2008 alone, the company more than doubled its workforce. The additions are continuing this new year as the company launches in more cities and neighborhoods including Austin, San Antonio and Houston. Anyone interested in the open positions can send their resume. BestofTexas.com provides local residents and travelers to Texas a one-stop source for the most up-to-date information and user reviews on events, businesses and services - from dining to professional services and everything in between. At BestofTexas.com, they're not just another online information provider - they're a lifestyle provider. 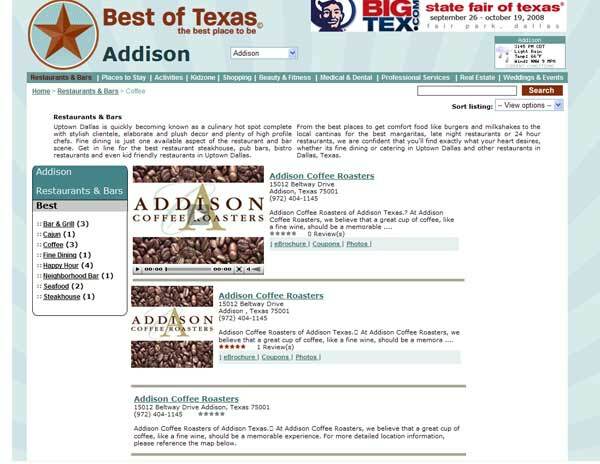 For more information regarding advertising with BestofTexas.com, visit http://www.bestoftexas.com/advertise.php. Video Screen ShotAdvertising Positions Win A Trip for 2 to the Cayman Islands!Become a member of BestofTexas.com and get entered to win. Best of Texas Media KitMedia Kit Best of Texas BillboardWin a Trip for Two to the Cayman Islands!